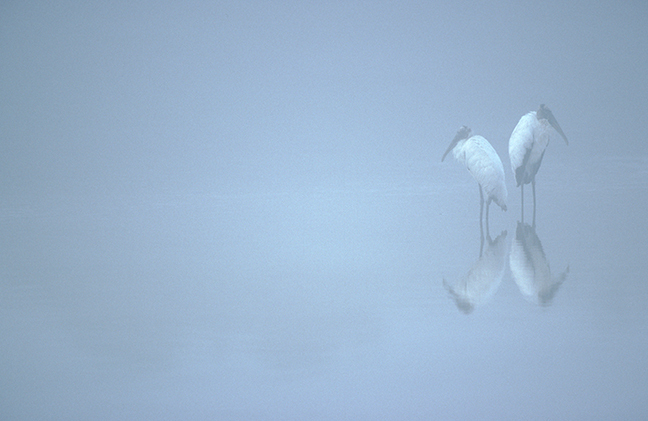 After three decades on the endangered species list, the Wood Stork was upgraded to threatened on June 26, 2014. They are the only stork that presently breeds in North America. They favors cypress trees in marshes or swamps and currently breed in Florida, Georgia and the Carolinas. They are specialized feeders submerging their bills into the water waiting for minnows to wander by. When they feel a fish they can snap their bill shut in as little as 25 milliseconds, one of the fastest reaction times of any vertebrate. They have to be efficient because an average nesting pair, with two fledglings, can eat more than 400 pounds during a single breeding season. They feed in flocks and nest in large rookeries, sometimes several pairs in a single tree. Anhingas live in shallow, sheltered waters and use perches and banks for drying and sunning. They are rarely found out of freshwater. Anhingas do not have waterproof feathers and can therefore stay below the surface for longer periods of time stalking fish around submerged vegetation. They usually stab prey from the side with both mandibles, and a partially opened bill. They hunt small- to medium-sized fish and occasionally crustaceans and invertebrates. 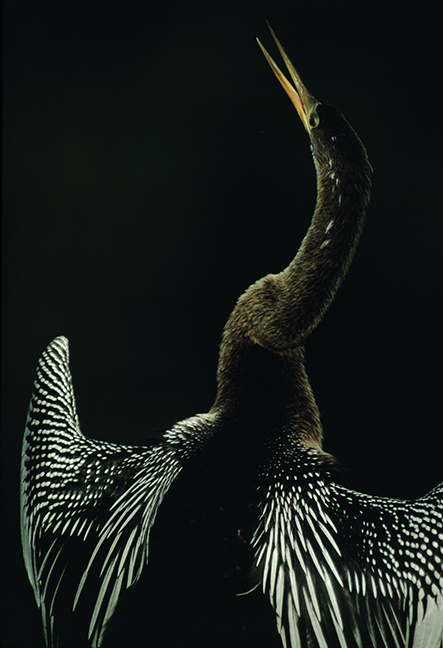 The word anhinga comes from the Brazilian Tupi language and means devil or snake bird. Double-crested Cormorants are common around fresh and salt water across North America and may be found in almost any aquatic habitat. They forage by diving from the surface and swimming underwater, mostly propelled by their feet. They are opportunistic feeders with a mixed diet of fish, crabs, shrimp, crayfish, frogs, salamanders and eels. After fishing, they often stand with their wings spread open to dry. In the western United States they have become victim to decreasing salmon populations. In March 2015 the U.S. Army Corps of Engineers approved a plan—with the support of U.S. Fish and Wildlife—to reduce the size of a large colony near the mouth of the Columbia River by oiling their eggs and shooting adults to reduce predation on salmon smolt. 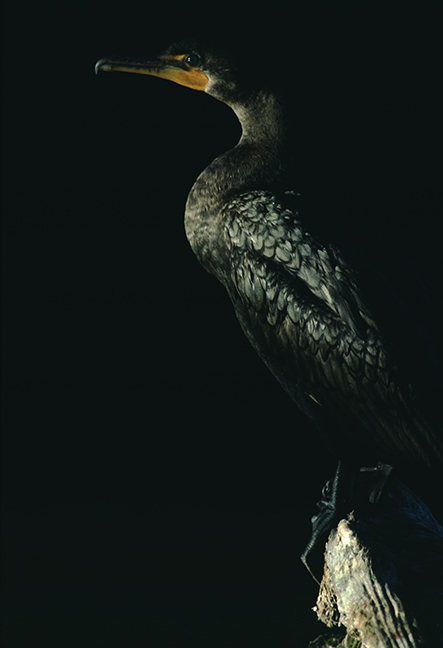 The plan will eliminate 15 percent of the Double-crested Cormorants west of the Rocky Mountains. 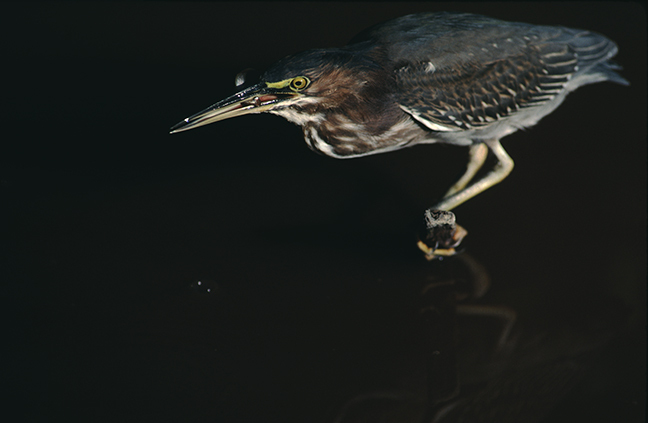 Green Herons can be found within small wetlands in low-lying areas, most often during dusk and dawn. They typically stand on shore or in shallow water or perch upon branches and await prey. Sometimes they drop food, insects or other small objects on the water's surface to attract fish, making them one of the few known tool-using avian species. They are seasonally monogamous and nest in forest and swamp patches, over the water or in plants near water. Gull-billed Terns most often nest on beaches or costal islands, scraping together shells and twigs as a nest and lay two to five eggs (pictured). Their preferred habitat is salt marshes, coastal fields and bays. They forage over marshes, pastures, farmland and other open country just inland from coast. They take insects on the wing or swoop down to take prey off the water or ground. 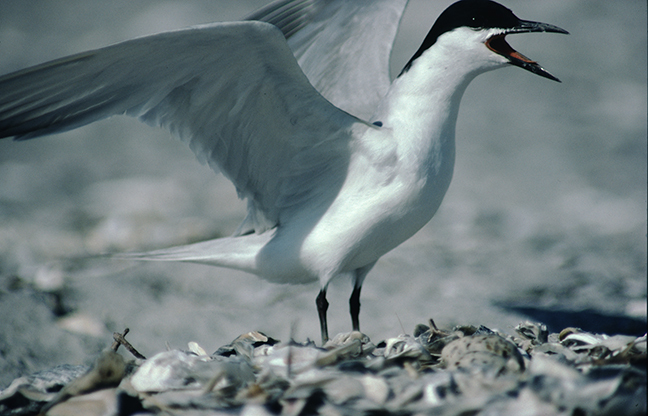 Unlike most other terns, they rarely dive into the water for fish. 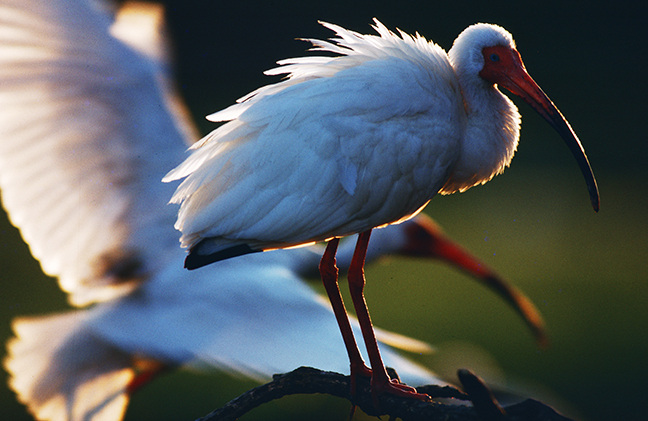 The American White Ibis is found in a variety of habitats, although they prefer shallow coastal marshes, wetlands and mangrove swamps. Their diet consists primarily of small aquatic prey, such as insects and small fish. Crayfish are its preferred diet in most regions, but it can adjust according to the habitat and prey abundance. They probe with their beaks at the bottom of shallow water to feel for and capture prey. They do not see their prey. They are territorial and often snap, lounge, posture and bite other birds in the nesting colony. 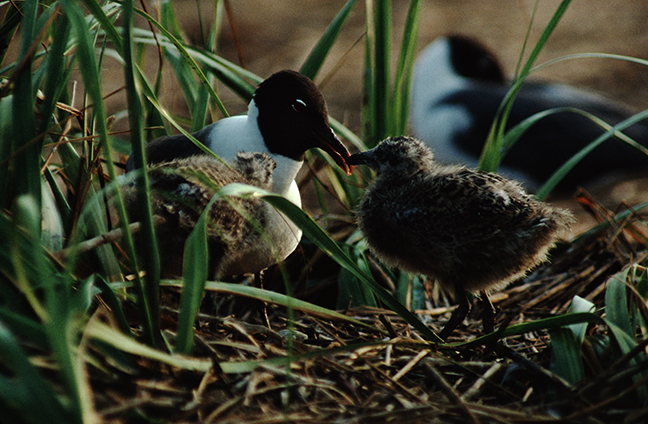 Laughing gulls breed in in large colonies near coastal marshes and ponds. They build large grass nests directly on the ground. They seek prey on water and land, eating mollusks, fish, bird eggs, young birds, squid, crabs and other crustaceans, insects, carrion and even garbage. They skim the surface or dive into the water and also take insects on the wing. They are named for their loud laughing call. They hunt, nest and migrate in groups. 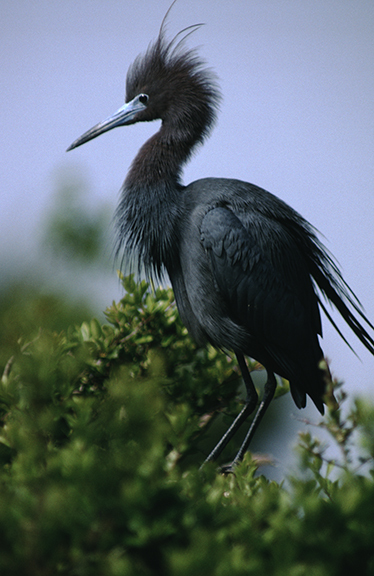 Little Blue Herons are found on quiet inland fresh water, river swamps, marshy lakes and flooded fields. They are slow and methodical foragers, walking in shallows or standing still waiting for prey to approach. They hunt mainly small fish, crabs and crayfish. Due to their color and lack of long plumes they were not a major target for plume hunters who decimated white egret and heron populations in the late 19th century. Juveniles are entirely white, except for vague dusky tips on their outer primaries. When molting into adult plumage they are a mix of white and blue. The Brown Pelican is the smallest of the eight pelican species, three of which are resident in the Western Hemisphere. When foraging, they dive bill-first often submerging completely below the surface as they snap up prey. Upon surfacing they spill the water from their throat pouch before swallowing their catch. They are one of only two pelican species that feed by diving into the water. DDT and other pesticides decimated brown populations in the early 1970s and led to its listing under the U.S. Endangered Species Act from 1970 to 2009. DDT was banned in the U.S. in 1972. 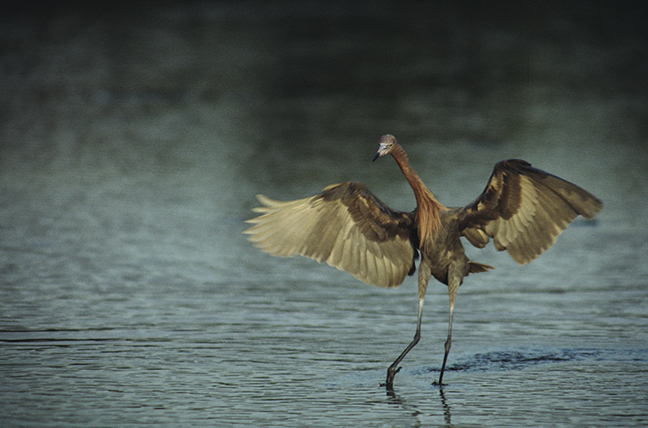 Reddish Egrets are found along the Gulf Coast of the United States where there are thought to be less than 2,000 nesting pairs, most in Texas, where they are classified as threatened. They breed within colonies, often with other herons on coastal islands. 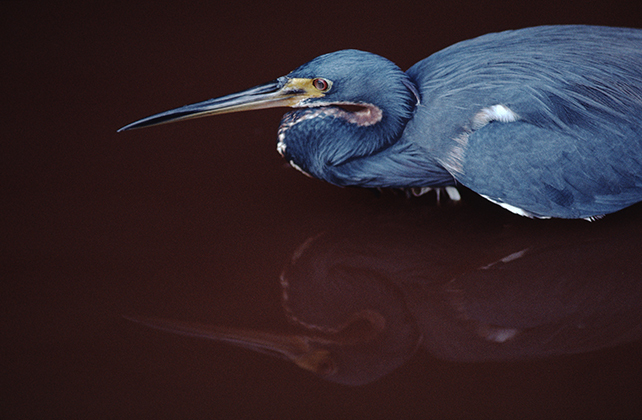 They stalk their prey visually in shallow water far more than other herons and egrets, frequently using the shadow of their wings to reduce glare on the water once they are in position to spear a fish (shown). 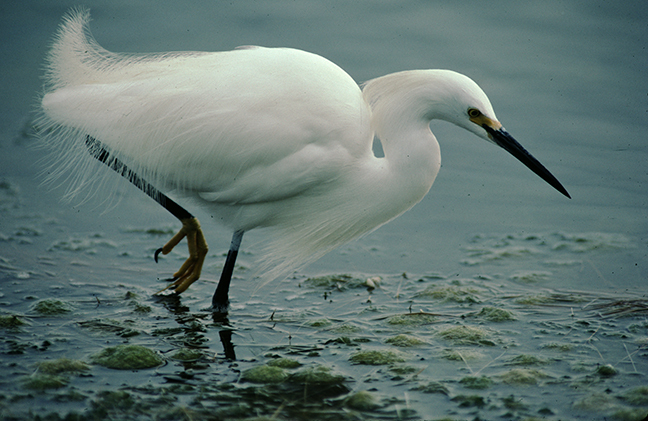 Snowy Egret populations were decimated in late 1800s when their plumes were in great demand as decorations for women's hats. They are now protected in the U.S., under the Migratory Bird Treaty Act and are widespread in many aquatic habitats, both fresh and salt water. 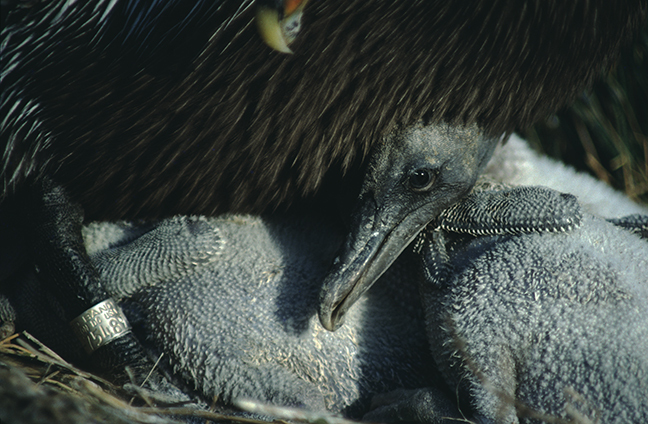 They nest in colonies on thick vegetation on barrier, dredge spoil and salt marsh islands. They often stalk their prey running through the shallows to displace aquatic animals, including fish, frogs, worms, crustaceans and insects. Tricolored Herons, formerly called Louisiana Herons, are resident breeders in the Gulf States. They are found in waters of coastal lowlands and inland around freshwater marshes, lakes and rivers, often in large mixed colonies of egrets and herons. They forage in shallow water by standing still and waiting for prey to approach, or by walking very slowly stirring bottom sediments. Although they are colonial nesters, they are solitary foragers. They eat mostly small fish, as well as crayfish, prawns, aquatic insects, grasshoppers, tadpoles, frogs, salamanders, lizards and spiders.